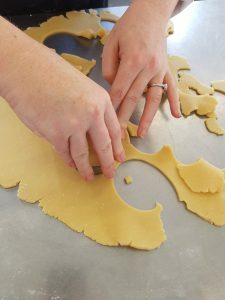 Well, somehow, we are nearly finished our fourth week of Modern Skills for Modern Chefs. I think the course goes by more quickly each time we put it on! 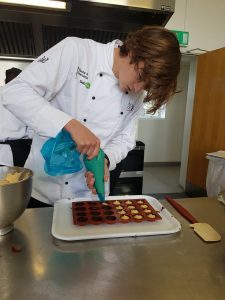 We have such a great, diverse group of student chefs this time and we really have thrown them into the deep end of the food industry, which started their first week when we had our first Fiver Friday Lunch (as featured in The Irish Times online). On Fiver Friday, we offer a different three-course menu each week. The student chefs prep, cook, plate and serve the meal to members of the public – which includes many members of the local community as well as those who have travelled to try the students’ cooking! It’s great experience for them, because they are doing literally every job in a restaurant: maitre d’, working the pass, serving, bussing and cooking at different kitchen stations each week. We have a small grab-and-go section at the door where those who have ordered takeaways can purchase a small dessert, prepared food product (this week we are selling free-range beef bone broth) or bag of our coffee bean of the month (this month we’re featuring Ponaire beans, which are roasted in nearby County Tipperary). 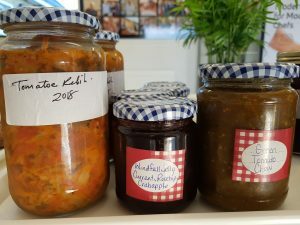 We also sell the preserves we have made from our garden over the months – our green tomato chutney, windfall jelly (made from foraged berries and crabapples; great with cheese) and preserved beetroot, for example. We try to use as much local produce in our lunches as possible, buying vegetables from our local Camphill Community and small suppliers and using what we can from the school’s garden. The bone broth on sale this week was made from beef from our butchery instructor, Clive Clarke. He raises his animals ethically and kills and butchers them himself, in his own abattoir. While we are kept busy with our Fiver Friday offerings, we always keep in mind the fact that all of this is being done for the benefit and experience of our student chefs. We talk openly about the restaurant industry and discuss ways of managing stress and practising mindfulness, even when we’re at our busiest. We collaborate with other chefs and restaurants that share this ethos to provide healthy work placements for our student chefs, which begin next week. We hope you’re all enjoying the slightly longer days of February. Do come down to the school to explore the garden, meet the students and have some lunch – our Fiver Friday lunches will continue, for this course, until the 22nd of March.